I know, I know. Long time since I last posted, but I blame the rain (depression) and then the sheer busy-ness that ensued whenever it wasn't raining. This was the garden early this afternoon. My sister had just finished weeding and everything looks frighteningly tidy. But then again, most of the stuff has been in there for just about a month, so it still is under control. Just wait until August. Under the short row cover are the melons. 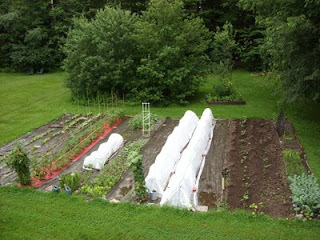 The two rows together that are still undercover are the cucumbers on the left and the squash on the right. 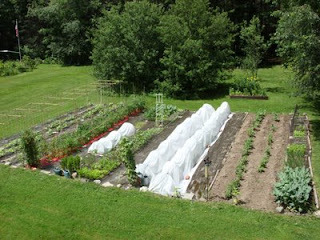 It truly seems to be the best way to keep the cucumber beetles at bay. 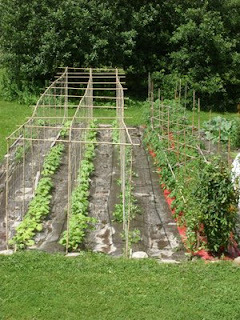 I was busily building the trellis supports for the beans and peas over the weekend, the end of my vacation. I have supports every four feet and crossbeams as well. All of the bamboo is new this year, which means I have every hope that it won't collapse under the strain of weighty plants. To the right are the tomatoes. I have concocted what I think may be a brilliant trellis concept. I am using the older bamboo posts as supports and running more bamboo the length and then criss-crossing the planting area. I still have at least one more level to build, but the plants are slow to grow because of the cooler weather we've been having. Last week we had two days when it was barely 50 in the daytime - and it was raining to boot. For comparison sake, here's the garden last week before we got much sunshine. Amazing how much stuff will grow when it has sun.